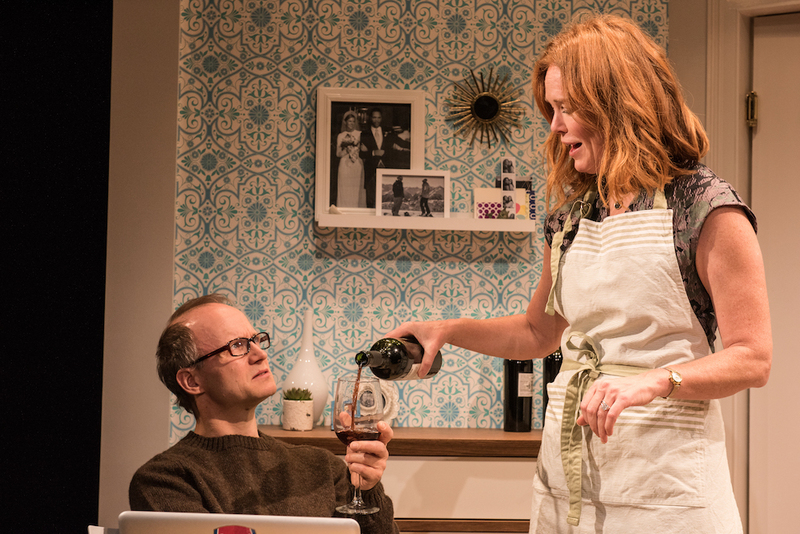 Muswell Hill, Torben Betts’s 2012 acidic British dramedy, now being given an acid-free New York premiere in a joint production of The Barrow Group and The Pond Theatre Company, is about a disastrous dinner party. 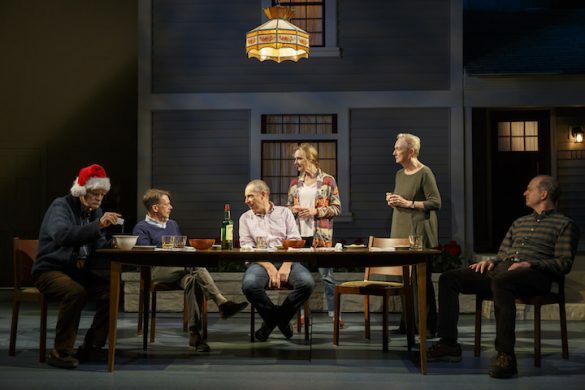 Like the barroom play, the hotel play, the shipboard play, the school play, and so on, the dinner party play is a convenient way to create a dramatic salad mingling disparately interesting characters. The playwright gathers family members, friends, casual acquaintances, or even strangers in a single place to see how their interactions explode on the theatrical palate. Alan Ayckbourn and Mike Leigh have trod this ground before, as have, among many others, Kaufman and Ferber in Dinner at Eight (1932), which ends just as the party is starting; Donald Margulies in Dinner with Friends (1999), which begins with the dinner and flashes back to its characters’ earlier lives; and Moira Buffini in Dinner (2002), which, like Muswell Hill, focuses entirely on the dinner party itself. Muswell Hill is an exclusive north London suburb where an attractive couple, feckless, wannabe novelist Mat (Jason Alan Carvell, as boring as his role) and his successful wife, Jess (Colleen Clinton, low key but real), have their upscale home, paid for out of Jess’s earnings as an accountant/executive. Their guests, nicely captured by Kristin Isola’s appealing, if stereotypical, costumes, arrive seriatim, beginning with Jess’s loquacious friend, Karen (Lily Dorment, competent). Karen, whose ecologically fastidious husband recently committed suicide, is a finicky vegan; Jess, therefore, agrees to substitute an omelet (made as we watch) for the monkfish dinner she’s preparing. Then comes Mat’s pedantic, unsociable, college friend Simon (Richard Hollis, disappointingly flat), a world-traveled, cynical, anti-American leftist. He, in turn, is followed by Annie (Sarah Sweet, annoyingly charmless), Jess’s 23-old sister, a drug and booze-using bimbo. Annie shows up with her uninvited boyfriend, Tony (John Pirkis, unconvincingly cast), a pretentious, womanizing, married, 60-year-old drama teacher. Annie foolishly expects he’ll help her become an actress/singer; she also believes he’ll divorce his wife and marry her instead. The gathering, which Jess arranged in hopes of fixing Karen up with Simon, takes place in 2010 on the evening that Haiti suffered the catastrophic earthquake that killed well over 100,000 people and left 2 million homeless. Instead of the usual dining room, all the action occurs in the home’s sleek, modern kitchen (designed by Edward T. Morris), its central island equipped with a much-used practical sink and stovetop. 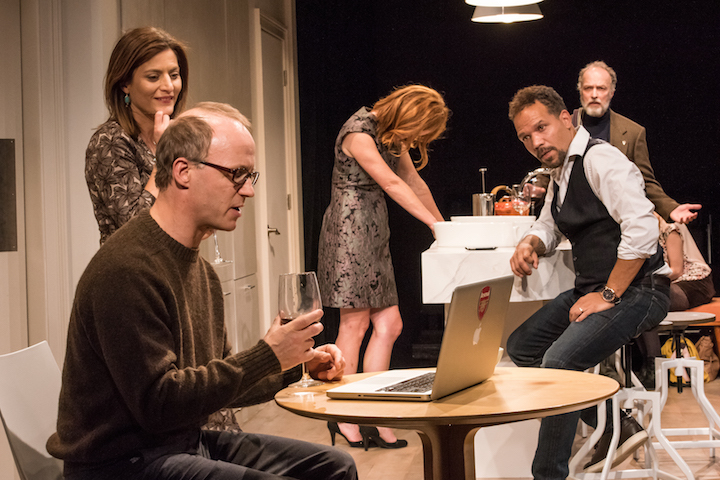 Over the course of two acts running two hours, during which so much wine is guzzled you hope the actors have access to an offstage bathroom, the talk jumps from subject to subject. We learn of the marital tension between Mat and Jess, who’s involved with another man, and of Karen’s preoccupation with her late husband’s memory and her initial unease with Simon. He, in turn, is fascinated by the beautiful Annie, whose talentless pretensions are shown in distractingly farcical passages of awful acting and singing. Tony, more Annie’s father substitute than her lover, is preoccupied with his own shaky marriage, while Simon spouts his views on class, economics, real-estate prices, and Obama-era politics. The mostly self-important characters are petty, insecure, and unable to see themselves as others see them. They prefer to stare at their computers or phone screens rather than communicating with others and react with lip service to one of the greatest disasters of recent times (just like most of us). Much of this should zing us sharply but Shannon Patterson’s unexceptional production—on a wide, shallow thrust placed along one of the long walls in the small, rectangular venue—muffles the zingers. The audience laughed often but little of the humor landed where I was sitting. 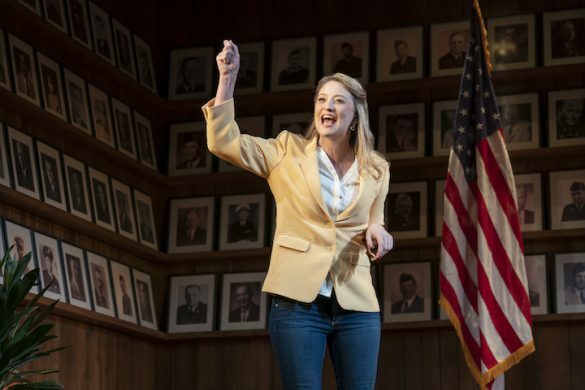 Insufficiently dynamic acting and interplay, often inaudible dialogue, and staging that favors two of the three sides surrounding the stage are of no help in hiding weaknesses. Take, for instance, the several moments where characters learn information by eavesdropping (or, unbelievably, reading lips in a laptop screen’s reflection). Or the key thematic moment when Karen recites in detail a Buddhist parable about the necessity of kindness, so artificial-sounding coming from someone we’ve had no indication was such a savant. I admired Colleen Clinton’s ability as Jess to oversee the preparation, cooking, serving, and cleaning up of a meal while simultaneously handling the complications erupting among her guests. 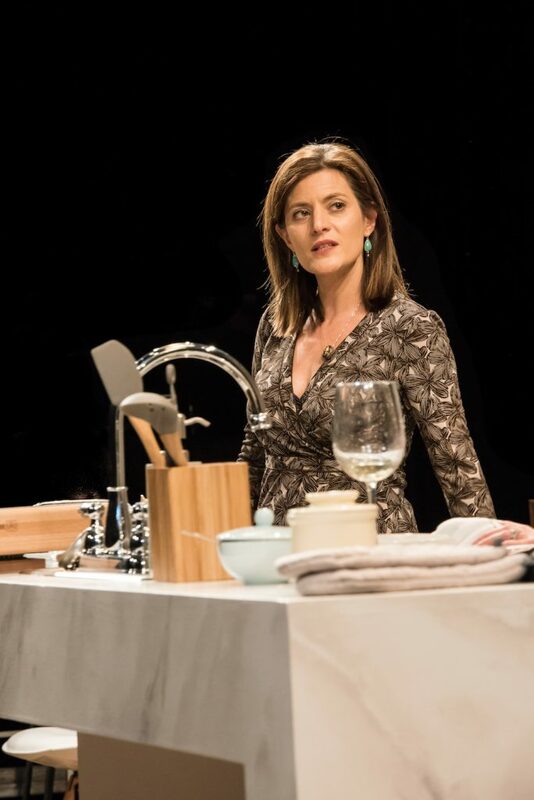 Since Jess simmers more than she boils, however, she alone isn’t able to give this Muswell Hill the much tastier performance ingredients it needs.